When doctors said no, God said yes. Renelle Roberts is a woman who pursues her dreams. In college she took a semester off school to compete as Ms. Connecticut in the Ms. America pageant. Her Trinidadian heritage, her elegance, and her striking dance routines set her apart from the competition. After college, Renelle moved to Virginia Beach and began working for the popular Christian broadcast show, “The 700 Club.” Renelle became a producer who traveled throughout the nation interviewing remarkable people. She told the stories of ministers, prisoners, and even celebrities like Denzel Washington. Although Renelle’s career was progressing, a part of her heart longed for something more. Renelle had a deep desire to be a wife and start a family. At the age of 26, Renelle received disheartening news. Doctors found a tumor on one of her ovaries and had to remove it. By God’s grace, Renelle endured that surgery. After that trial, she experienced joy when she married a wonderful man named Casey. As the couple sought to have children, Renelle was diagnosed with polycystic ovarian syndrome on her remaining ovary. Doctors informed her that polycystic ovarian syndrome is a leading cause of infertility among women. The circumstances were bleak, and the Robertses wrestled to remain hopeful and trust in God. CBN recently interviewed Renelle and told her inspiring story in a piece called “When doctors said ‘No’, God said ‘Yes’.” The video highlights a miraculous healing that lead to the birth of their baby daughter, Daphney. Christina – In the video we see you had a dream in your heart for years to be a mother. When did your love for children begin? Renelle – My love for children started in college. My freshman year I worked at an inner city children’s program called Leap. It was during that time I realized that kids truly need adults in their lives to help guide them. I saw how much love and attention they require. I also volunteered at my church to help out in the nursery. I worked in the nursery for four to five years because, as a single woman, I wanted to help moms and invest in the lives of children. Christina – Speaking of volunteer work, I know you also spent time working at a Crisis Pregnancy Center. What motivated you to work in that type of organization and what was your experience like? Renelle – As a Christian, I had pro-life beliefs, but they deepened when I went to graduate school and learned more about abortion. I realized what an epidemic it was. I wanted to do something to help. As I was reading my church bulletin one day, I saw a message that a Crisis Pregnancy Center needed volunteers. I began working there and it taught me a lot about girls and teen motherhood. It helped me break free of judgmental thoughts. 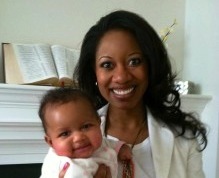 I was able to teach new motherhood classes and lessons on purity and abstinence. Christina – What do you think it means to be pro-life? Renelle – I believe that life begins in the mind of God. When we cut off life we are cutting off an idea that God has. God has thoughts about children before they are born. I think we should be whole-life. We should fight for people from the cradle to the grave. Being pro-life is caring for the unborn but also for the elderly, the homeless, and the helpless. If you are pro-life, you will pour yourself into the enhancing the lives of others. You will care for every life that crosses your path. Christina – I know you weren’t able to conceive for two years. That was a difficult time for you. Was it hard knowing thousands of children were being aborted daily when you weren’t able to have a child? Renelle – When someone throws away a dream that you have or takes it for granted, it’s always a struggle. A friend of a friend had an abortion while we were longing to have a child, and it was devastating. I try and look at what drives women to abortion. Looking at their pressures and understanding their motives helped me to put myself in their shoes and remain loving. Christina – Father’s Day is approaching soon. Tell me what it’s like to have Casey in your life as a husband and father to your daughter. Renelle – I recognize the African-American community is in a crisis when it comes to fatherlessness. I’m so grateful that Daphney has a dad who is also a spiritual leader. She has a father who loves her and trains her in the ways of the Lord. Every morning before work, he spends one-on-one time with her. He plays with her and tells her she is beautiful. Everyday, the three of us hold hands and pray together. I know she has a dad that protects, prays and provides for her. I got to hold Daphney as a newborn! I was encouraged by my talk with Renelle. She’s not only an amazing mom with a powerful story. She’s also one of my best friends from college. Her life continually inspires and challenges me. I pray her story leads you to fight for your dreams through faith. Editor’s Note: This summer, we will be providing you with a Life of the Week story every Friday. Our previous Life of the Week articles are here: Life of the Week: Coming your way soon and Life of the Week: Marlena Diedrich and the Acts of Grace Foundation. Please come back each Friday to find a new featured Life of the Week!